I was invited a while ago to write an article for a special issue of Theory, Culture & Society. The theme is, uh… a little hard to explain: we were asked to look at the 50 years leading up to and following World War I, focusing particularly on how the War both absorbed and anticipated various avant-garde movements and technological developments, including mediated sensing, weaponry, and tools for calculation and control. Building upon my research on Remington Rand’s information-management systems at the 1939-40 World’s Fair — which I published in Places this past February — I decided to focus on the arguably un-avant-garde world of filing and record-keeping, and to examine how cards and files — the “small, moving parts” of information — came to represent various fantasies about our urban and global futures. I have a feeling I’ll be asked to make some significant edits — so I figured I’d post the full, feral draft, just in case some of this material never makes it into print. Abstract: The great expositions and World’s Fairs of the 19th and 20th centuries were known for celebrating new technological developments. The world of index cards, fiches, and data management hardly seems germane to the avant-garde, one of the central concerns of this special issue – yet the fairs made clear that information management systems were themselves designed, and were critical components of more obviously revolutionary design practices and political movements. Cards and files became familiar attractions at expos throughout the long-20th century. But those standardized supplies came to embody different ideologies, different fantasies, as the cultural and political contexts surrounding them evolved – from the Unispheric “global village” modeled in 1964; to 1939’s scientifically managed World of Tomorrow; and, finally, to the age of internationalist aspirations that led up to World War I. We examine how the small, moving parts of information have indexed not only data, but also their own historical and cultural milieux. 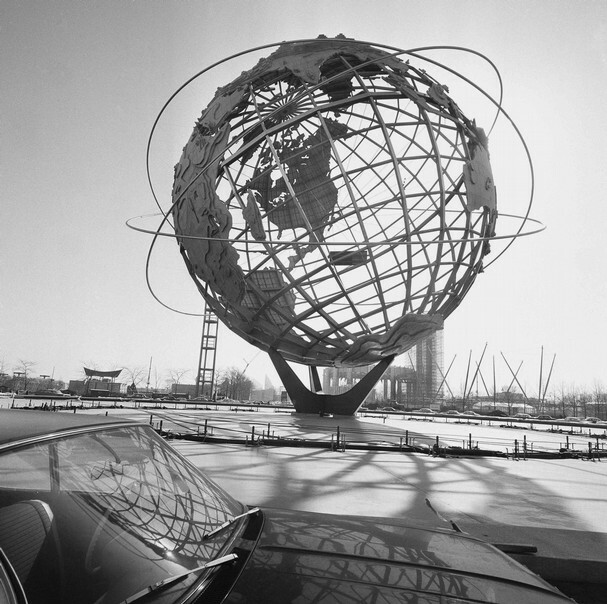 The 1964-65 World’s Fair in New York revolved around a 140-foot-high stainless-steel globe. That globe was itself encircled by three metal rings representing the flock of satellites that began orbiting the earth a decade earlier. Gilmore Clarke’s Unisphere embodied the mission of Robert Moses’s fair: to bring the world together to celebrate “Man’s Achievements on a Shrinking Globe in an Expanding Universe,” and thereby promote “Peace Through Understanding.” The 76-year-old Moses, New York’s infamous master builder – the Baron von Haussmann of the 20th century – was winding down his career here; in order to become head of the Fair Corporation, he had to resign from his city appointments. Many of the fair’s exhibits rivaled the scale, ambition and character – more authoritarian than avant-garde – of his half-century rein over countless massive public works. Rockets were everywhere on display, beckoning developers and settlers into new frontiers. General Electric’s Progressland pavilion and the Hall of Science spectacularized the atomic future and predicted a coming age of electricity “too cheap to meter.” Bell System chronicled the history of communications “From Drumbeat to Telstar,” mapped the routes of undersea phone cables, demonstrated “machines talking to machines,” and presented its own touch-tone phones, Picturephone, and Vocoder as future forces in further shrinking the globe and uniting humanity. Yet many fair-goers failed to see themselves in these colonialist depictions of an engineered universe – whether in a lunar colony, an Antarctic port, an undersea mine, a desert farm, or their own seemingly familiar cities. Critic Peter Lyon commented in Holiday magazine that “I saw no parks, no grass, no trees, though there may have been a few buried away on some sunless level below the soaring belts of concrete. It is a city for machines but not designed for people, not for me” (1964: 54). While images of fantastical technological, extraterrestrial futures were part of the Space Age zeitgeist, this was also an age of new utopian visions – new urban imaginaries. Moses met new rivals, including the indomitable Jane Jacobs and civil rights protesters, who challenged the lack of diversity and discriminatory hiring practices at the fair, as well as Moses’s decades of discriminatory planning practices (see Reitano, 2006: 160-3; Samuel, 2007: 33-41). This new mid-60s utopia, Morris Dickstein explains, was “local and communitarian, suspicious of large-scale planning and regimentation, convinced that Small is Beautiful, and that the ethos of development was blind to fundamental human needs” (1989: 32). The coming age was one of participatory democracy and civil rights, rather than the top-down master plan. Paradoxically, it was Moses’s fixation on the site’s long-term master plan that led him to exercise a relatively light touch in overseeing the fair’s architectural design. His primary interest in the fair, and its predecessor on the same site in 1939-40, was as a pretext – in his terms, a “gadget” – for the permanent development of Flushing Meadows Park. The fair was a means to reclaim marsh and wasteland and build roads for a park that would be his great legacy. Moses’s 1964 all-star design committee – consisting of Wallace K. Harrison, Gordon Bunschaft, Edward Durrell Stone, Henry Dreyfuss, and Emil Praeger – proposed a single, donut-shaped building that would house all the fair’s exhibits, but a frugal Moses insisted that they exploit the readymade 1939 site and push as many construction costs as possible onto individual exhibitors. Moses rejected the proposal, the design team resigned, and in its place arose a new committee chaired by Major General Thomas F. Farrell. Despite Farrell’s pedigree – he was former chairman of the New York City Housing Authority and deputy commander of the Manhattan Project – his inaptly-named Committee on Conformity oversaw the construction of a kitschy, non-conformist, “messy mélange of buildings” (Bletter, 1989: 107). Amongst that mélange was another spherical – or, rather, ovoid – structure that embodied another key transformative force of the age: the computer. The IBM Pavilion, designed by Eero Saarinen and completed upon his death by associates Kevin Roche and John Dinkeloo, was allegedly modeled after the “typeball,” a small, moving part in the new IBM Selectric typewriter. A steel canopy at the pavilion’s ground-level featured puppets acting out computer logic, displays of computer circuits, and demonstrations of probability and language translation. Visitors perched themselves in the “People Wall” bleachers, which were then hoisted up into the oval for a 15-minute multimedia show designed by frequent IBM collaborator Charles Eames. Using synchronized projectors, multiple screens, and a live host, the Information Machine presented a disorienting, kaleidoscopic mélange of scenarios: planning a dinner party and a football play, calculating a missile trajectory, designing a chemical compound. As these scenes played out across the screens “in fragments and glimpses,” Orit Halpern argues, visitors’ eyes moved “rhizomatically, making unexpected and nonlinear connections” within the “perceptual field” before them (2014: 124, 215). “Eames did not expect everyone to see everything,” Mina Hamilton proposed in a 1964 issue of Industrial Design magazine, concluding that the spectacle was “too fragmented to be entirely successful” (quoted in Harwood, 2011: 192). Yet architectural historian John Harwood argues that Eames deliberately aimed to promote productive confusion, to “shatter” perspective – perhaps to mirror the binary logic of the computer itself; the spectacle relied upon “breaking down the whole into innumerable bits” (2011: 193). Halpern proposes that Eames presented “information inundation” as a virtue, as a means of training visitors to discern pathways and patterns between fragments and glimpses – to find order (and beauty) amidst the small, moving perceptible units (28). Even the design of the pavilion itself – its labyrinthine stairs, its jumbled queues, its bleachers with no clear point of reference – staged similar moments of displacement and disorientation, yet they all ultimately revealed their logic. Bits and bodies passed through logic gates, and tangled circulation routes straightened into neat rows. The “apparent message,” Rosemarie Bletter proposes, was that “apparent chaos can lead to order” (1989: 110). The fair showcased computerized intelligence in many novel aesthetic and material forms: satellites and Picturephones, mainframes and multi-channel entertainments, rockets and Antarctic weather stations. Yet the components – the keys and cards and fragments of intelligence – that generated those “instant facts” and “swift communications” were not new: in fact, the manual and electro-mechanical techniques and technologies that made possible the digital Information Age celebrated in 1964 were among the key attractions at New York’s other World’s Fair, just 25 years earlier on the very same site, and by other expos in the preceding half-century. Those information products and processes were profoundly shaped by both world wars, and even by the Civil War before it. If the early 19th century gave rise to many new machines – rifles, machines, typewriters – with small, moving parts, the turn of the 20th century brought myriad new technologies and techniques that allowed for the production, storage, and analysis of information in small, moving parts. The great expositions and World’s Fairs of the 19th and 20th centuries were known for celebrating new technological developments. The world of index cards, fiches, and data management hardly seems germane to the avant-garde, one of the central concerns of this special issue of TCS – yet the fairs made clear that information resources and information management systems were themselves designed, and were critical components of more obviously revolutionary design and practices and political movements. Cards and files became familiar attractions at expos throughout the long-20th century. But those standardized supplies came to embody different ideologies, different fantasies, as the cultural and political contexts surrounding them evolved – from the networked Unispheric “global village” and computer-engineered worlds of consumption and resource-extraction modeled in 1964; to 1939’s scientifically managed World of Tomorrow, which sat restively between the Depression and the Second World War; and, finally, to the age of internationalist aspirations that led up to, and were revived after, World War I. In this article we’ll examine how the small, moving parts of information – of filing and indexing and computation – have indexed not only data, but also their own historical and cultural milieux. At the 1939-40 World’s Fair, exhibitions by RCA, Kodak, Westinghouse, and AT&T celebrated (and aestheticized) the communications devices and machines of information management that powered The World of Tomorrow, a world that promised robots and nylon stockings, “picture radio” and speech synthesizers, Plexiglas and 3D film, fluorescent lights and fax machines. The future was imagined to take place within a neo-Corbusian city: streamlined, rational, orderly, efficient. The World of Tomorrow, Leonard Wallock writes, “was the city’s perfected dream of itself” (1988: 20). It manifested desires for “scientific rationality, technological progress, modernist aesthetics, industrial design,… consumer prosperity, and… corporate capitalism” in spatial form, via rational urban planning and progressive civil engineering, modernist architecture and sterilized suburbs (Bennett, 2010: 177-8). Just as important – though much less discussed – was the dream of efficient urban administration. Record-keeping and filing were central to the World of Tomorrow and its urban imaginary, too. A 1939 article in The New York Times describes an exhibit packed with typewriters, “elaborate computing machines and indexers, sorters and apparatus that seems (sic) almost capable of taking a national census at the push of a button” (“The Exhibits: An Amazing Array”). Exhibitors somehow even found means of dramatizing life insurance and credit analysis. And as the financially struggling Fair continued into its second year, under a new theme — “For Peace and Freedom” — that acknowledged the war in Europe, the World Fair Corporation’s ambitious office manager proposed an exhibit of her own. Katherine Brougher Gray aimed to display the efficiency of the Fair’s administrative operations by pulling her Mail, Stenographic, Addressing and Duplicating Units out from behind the scenes and putting them on stage in a 1500-square-foot demo area. “My personal interest in pushing this plan,” she wrote, “quite naturally arises out of the pride I feel in the efficiency of the Office Management Department here at the Fair” (Gray, 1940). She invited the participation of companies like IBM, Remington Rand, Addressograph-Multigraph, Ditto, Hammermill Paper, Strathmore Paper, and Eagle Pencil, and promised to “show [their] products in actual use on current work in the hands of regular employees – to millions of people.” These were the moving parts facilitating efficient administration of the World of Tomorrow. In a “panorama” of their contributions to the “World of Business,” Remington Rand’s own exhibit featured four stages where actors would dramatize the use of various types of office equipment, while sound and lighting devices “heightened dramatic effects” (“Remington Rand, Incorporated,” n.d.). Remington Rand’s electric close shavers took center stage, but one full side of the exhibit was dedicated to the company’s “business systems and equipment, including tabulating and accounting machines, adding machines, visible [card filing] and loose-leaf [filing] equipment, record protection equipment, portable and commercial typewriters and supplies” — along with a display of how its Dexigraph photographic technology could be used in the reproduction of business records (New York World’s Fair Inc., 1939). Notably, the company was not located in the “Communications and Business” zone of the Fair, alongside peers like AT&T, Crosley Radio, RCA, Underwood typewriters, Universal Camera, and various publishers; but rather in the “Production and Distribution” zone, next to Westinghouse and its Elektro robot, and Electric Light and Power Companies. Tied to both communication and power companies, Remington Rand seemed to straddle two categories in the Fair’s spatial taxonomy: it represented the electrification of – perhaps even the spectacularization of – the once painful banality of record-keeping. Remington Rand rarely appears in our shorthand histories of computing, but since the early 19th century the company had played a central role manufacturing the mechanics of the Information Age (for a fuller history of the company, see Mattern, 2016). The three companies that eventually merged in the mid-1920s to form Remington Rand – E. Remington and Sons, the Rand Ledger Company, and the Library Bureau – started off making rifles, typewriters, cash registers, ledger filing systems, filing cabinets, library equipment, and card catalogs: all machines for storing and moving small, moving parts, whether bullets or coins or files. By the 1930s, Rand, through various acquisitions, had expanded its portfolio to include office furnishings, adding and punched-card tabulating machines, and – incongruously – electric shavers. This was the Remington Rand that exhibited at the 1939 Fair – a company eager to distinguish itself from its rising rival, Thomas Watson’s International Business Machines. While IBM ultimately dominated in the world of bits, Remington Rand and its antecedent companies developed several breakthrough technologies in the realm of analog files. The Library Bureau’s card catalog, originally developed for libraries, eventually proved its utility as an indexing system for any business or professional office, for any kind of record-keeping (see Flanzraich, 1993 and Krajewski, 2011). Compared with the bound ledger, previously the dominant means of record-keeping, the card catalog allowed for greater “ease and speed of reference,” as well as simpler modification, expansion, and removal of records – in other words, easier management of those small, moveable parts – thus producing savings in “time, in labor, in space, and in clerical expense” (Library Bureau, 1909: 7). Moreover, it elevated office work to “scientific” analysis. The Bureau proudly declared in 1909 that its “greatest asset” was the adaptability of the card catalog to the “new Science of Business System” (5). Now a manager could easily compare sales data across categories, identifying weak goods or customers, weak salesmen or territories. The factory owner could track the efficiency of each machine, each operator, each process – each moving part – in the chain: “The reason for every fluctuation in cost and result is known. And these facts are collected, analyzed, compared, by fixed methods of almost automatic simplicity” (13-14). Real-time analysis enabled prediction and preemption: “He can not only check bad conditions before they have done serious harm, but he can generally correct bad tendencies before they have developed” (15). The card index promised “working principles as positive and scientific as the science of war itself” (18). Thus the Bureau was already advocating for “the principles of scientific management,” two years before Frederick Winslow Taylor published his canonical text on the subject. The company’s martial metaphor proved prescient, too, as small cards – particularly punched cards – became an integral instrument in the early-20th-century’s “mechanization of warfare” (Agar, 2003: 159). In World War I, the U.S. used punched cards to record soldiers’ medical and casualty statistics, for example, and the War Industries Board used them to “control the production and distribution of virtually all goods and services” (Heide, 2009: 64). While the military-industrial complex propelled a dramatic increase in the use of card-based record-keeping systems, these small, moving parts were already in use well before the war. As business and bureaucracies grew in the late-19th century, various entities – corporations and cities, merchants and governments, dentists and teachers – came to embrace records-management as integral to their efficient and profitable operation, and they relied on an expanding industry to design, furnish, and manage their record-keeping systems (see Yates, 1991). After Herman Hollerith’s punched card tabulating machines proved effective in calculating Baltimore’s mortality statistics, the U.S. Census Bureau employed the machines in their 1890 census. Afterward, insurance companies, public utilities, railroads, international governments, and many New Deal agencies adopted the technology to calculate invoices, issue pay slips, and perform more complex data-processing tasks (see Adams, 1995; Agar, 2003: 147-54; Heide, 2009). While its filing business flourished, Remington Rand returned in World War II to its firearm roots, manufacturing more small parts for the war: bomb fuses, the M1911 pistol, and the Norden bombsight. In 1951, after another acquisition, they delivered a larger-scale contraption – the first commercial computer system, the UNIVAC I – to the U.S. Census Bureau. The following year, Rand acquired Engineering Research Associates, pioneers in drum memory systems. The move into computing represented a logical next step — crossing over the analog-digital divide — for a company that had, since the 1880s, concerned itself with the efficient production, sorting, storage, and retrieval of data; with the management of information’s small, moving parts. When Remington Rand merged with the Sperry Corporation in 1955, it was on the cutting edge of computing, navigation, and automation. Sperry made marine navigation equipment and aircraft instruments, including autopilot. Yet even within the future-tech company of Sperry Rand there were still divisions dedicated to “physical data handling” – that is, files. The old guard hung on until 1978, when the company, which by then had lost considerable market share to IBM, finally sold off the Remington Rand divisions. In 1986, Sperry succumbed to a hostile takeover by the Burroughs Corporation (itself founded a century earlier as a manufacturer of mechanical adding machines), and elements from that merger exist today as Unisys, the global IT company. Remington Rand survives as Kardex Systems, a Swiss company specializing in automated storage and materials handling. That original module, the card file, has grown so big as to encompass logistics writ large. As the 1939-40 and 1964-65 worlds fairs reminded their visitors, those small, moving parts of information technology ultimately made grand visions – the World of Tomorrow, and grand-engineering projects of the Unisphere, the space and computer ages – possible. Chicago’s great Columbian Exhibition of 1893 brought another filing system to the world’s attention. The Library Bureau, before it was folded into Remington Rand, had been commissioned in 1892 by one Dr. Nathaniel Rosenau, secretary of a charitable organization in Buffalo, NY, to create a special open “briefcase” allowing for the efficient storage of files on-edge. The contraption was then put on display at the fair, and the vertical (or suspension) filing cabinet – which revolutionized the way papers were shuffled in offices and archives across the world – was added to the Bureau’s sales catalog (see Filing Primer, 1921: 3; Krajewski, 2011: 100-1; Yates, 1989: 56-63). Meanwhile, at a series of expositions in Europe, Paul Otlet and Henri La Fontaine, both Belgian peace advocates and lawyers and co-founders of the International Institute of Bibliography (IIB), introduced their own system of small, moving parts. Just as Melvil Dewey, founder of the Library Bureau, intended for his company’s furnishings and equipment to reinforce adherence to their organizational systems, particularly the Dewey Decimal System, Otlet and Fontaine’s filing system was much more than a bureaucratic mechanism: it was an intellectual and ideological one, too. Otlet believe that all literature – all books, chapters, articles, lectures, and audiovisual media – could be “winnowed” into (1) facts, (2) interpretations of facts, (3) statistics, and (4) sources, thus revealing what unique contributions each resource made to the world of knowledge (Otlet, 1893: 16). The ideal…would be to strip each article or each chapter in a book of whatever is a matter of fine language or repetition or padding and to collect separately on cards whatever is new and adds to knowledge. These cards, minutely subdivided, each one annotated as to genus and species of the information they contain, because they are separate could then be accurately placed in a general alphabetical catalogue updated each day (Otlet, 1893: 17). Otlet thought a medium’s “fine language” and form were extraneous to its intellectual contribution; in fact, he regarded bibliographic form as primarily accidental: the book, he argued, is merely “a single continuous line which has initially been cut to the length of a page and then cut again to the size of a justified line” (Otlet, 1918: 149). “Documentalism,” rather than bibliography, was based on the “monographic principle”: “one work, one title; one title, one card,” each “deal[ing] with a single intellectual element only” (Otlet, 1918: 149; 1920: 186). Because the IIB’s 12.5 x 7.5 cm cards (equivalent to the American three-by-five-inch card) – like Dewey’s – constituted small, standardized, easily moved parts, they allowed for “manipulations of classification and continuous interfiling” (Otlet, 1893: 18). And to facilitate retrieval and interconnections, those millions of cards were housed in specially designed catalog furniture and filing cabinets; partitioned using specially designed, color-coded divisionary cards; and linked together into a Universal Bibliographic Repertory (and later a Universal Iconographic Repertory and Universal Repertory of Documentation) via the Universal Decimal Classification, a faceted (combinatory) system adapted from the Dewey Decimal System (Rayward, 1994: 242). Belgium sat at the hub of much internationalist activity during the late 19th and early 20th centuries. International organizations arose with various aims: to promote free trade, to unite workers and women in the pursuit of universal rights, to champion world peace, even in some cases to reinforce nationalist interests by establishing particular countries – like Belgium – as brokers of that pax orbis terrarum (see Laqua, 2013). Such ideals and aspirations preceded the first World War, but were reinvigorated after it. Otlet envisioned a République Mondiale, a Global Republic, served by an international information service, one committed to capturing all the world’s knowledge and promoting global exchange and understanding. He framed his vision in terms that would ideally resonate with the powerful individuals and organizations building and funding international ties. Just as Dewey’s Library Bureau equated their operations with the “science” of business and the machines of war, Otlet validated his bibliographical practice through popular scientific language, via “tropes of facts, atomic elements, laws, and energy circulation”; European documentation, as he represented it, was an “information science” (Day, 2001: 17). The Institute was a productive business, too. In a sketch from 1937, Otlet depicted a knowledge factory, the Laboratorium Mundaneum, where “mountains of documents” – books, journals, periodicals, correspondence, laws, patents, statistics – were mined and refined into the “purest matter useful for civilization.” Those processed, winnowed resources – packaged on index cards – were then deposited into train cars representing the knowledge classes of the Universal Decimal Classification system, and sent off to be manufactured into new knowledge (see van den Heuvel, 2014: 132). Starting in the late 19th century, many of the scientists, scholars, and entrepreneurs to whom Otlet appealed for support gathered regularly at professional conventions and trade meetings. The age of internationalism was an age of conventions, and the world’s fairs and expositions were among the movement’s grandest celebrations and instruments of propaganda. Otlet and La Fontaine, champions of such international exchanges (and conveners of many of them), regularly appeared – with or without their cards – everywhere from grand expositions and scientific conventions, to accountants’ and administrators’ meetings. At the 1900 Universal Exposition in Paris, they displayed over two million cards from their Universal Bibliographic Repertory, along with various bibliographic accessories and charts and graphs illustrating the Institute’s purpose (Rayward, 1975: 77-8). The cards appeared again at the St. Louis Exposition of 1904 and at the following year’s International Exposition in Liège. At the Universal Exposition of Brussels in 1910 Otlet and La Fontaine hosted the meeting of the World Congress of International Associations, whose members discussed the challenges of international collaboration and debated the standardization of weights, measures, and language. The expo also included an exhibit on the theme of internationalism, featuring parts of the IIB’s collection. Some of those exhibits were then repurposed for Otlet’s World Palace, or Palais Mondial, in Brussels, which displayed myriad instruments of knowledge: model airplanes, maps, diagrams, “projectors new and old, and gadgets drawn from all ages: microscopes, telescopes, navigation devices and printing tools” (Vossoughian, 2011: 97). The collection, which Otlet organized geographically and by research methodology, represented the small, moving parts of epistemological history – and implied that the cards of his Repository were the logical next step. Many of these global gatherings amounted to meetings about meetings, by associations of associations. At one such gathering – the 1923 meeting of the International Committee on Intellectual Co-operation in Paris – the Sub-Committee on Bibliography recommended a formal agreement between the new League of Nations and the IIB. Yet the committee at large took issue with the IIB’s hubristically universal mission, its incomplete collections, and its “propensity to overrate the value of index cards,” leading it to “mistake the means for the end” (qtd in Rayward, 1975: 278). Undeterred, the very next year Otlet drafted plans for a global Mundaneum, a world city that would incorporate a library, a university, a World Museum, and an International Associations Building. This was to be a global hub – one designed by the architect Le Corbusier – for the organization, preservation, and exchange of all the world’s knowledge. All those small, moving parts scaled up to form the building blocks for a grand architectural vision – a city made to embody “the actual state of the world,…its mechanisms, complexity… the general problems that impose themselves upon the attention of a people and its citizens and its leaders” (Vossoughian, 2003: 85). In its embodiment of pure ideology and its grand-engineered vision, the Mundaneum was not unlike the model cities of the world expos where Otlet began shopping his wares decades before, and where Dewey and Watson displayed theirs. Of course the world into which Otlet sought to insert his repertoires and Cité Mondiale was quite different from the inter-war World of Tomorrow, which Remington-Rand promised to render measurable and predictable and efficiently manageable; and from 1964’s competing global visions: a world of computer-engineered consumption and resource-extraction, and a networked Unispheric “global village.” Yet in all these exhibited cities-of-tomorrow and future worlds, information technology and records-management were central to the urban and global imaginaries and ideologies. Information resources – which, as the fairs made clear, were themselves designed – constituted powerful tools for city- and world-building. With a bit of a teleological twist, some scholars and critics have likened Otlet’s Repertory to a relational database and his Universal Decimal Classification to a query language, and have added Otlet himself – alongside Great Men like Vannevar Bush and Tim Berners-Lee – to the Internet’s family tree. We could insert Remington, Rand, and Dewey into that genealogy, too, for all were concerned with the production, sorting, storage, retrieval, and networking of data. Books themselves were networked networks, according to Otlet: books “contain and constitute networks or webs (“réseau”), both internally and externally in their relations with one another and to the world at large” (Day, 2001: 14). Otlet even envisioned, years before 1964, many of the technological wonders visitors saw at the fair in New York: he imagined “a system of networked computers,” or “electric telescopes,” “that would allow people to search through millions of interlinked documents, images, and audio and video files”; he “imagined that individuals would be able to upload files to central servers and communicate via wireless networks”; he imagined participatory, multimedia exhibition displays and technologies for transmitting taste and smell (Wright, 2014: 8, 9, 190-4). He also conceived of a workstation that would integrate a radio, telephone, microfilm reader, television, record player, and a collection of personalized documents in myriad media formats; display the relationships between these various documents; and recognize human speech (235-8). His Mondothèque was far more ambitious than Vannevar Busch’s Memex or any of the rudimentary, list-generating kiosks found at the 1964 fair. The Eames’ “fragments and glimpses” – the whole of knowledge broken down into “innumerable bits” and presented in a multi-stream flow – were prefaced by Dewey’s and Otlet’s indices and repertoires. Of course there’s a much deeper history to this epistemological winnowing and atomization – to the desire to refashion the world’s knowledge into small, moving parts, all easily manipulated and linked. Consider Konrad Gessner’s 16th-century cut-and-paste note-taking technique; Placcius’s stitched paper slips; John Wilkins’s 17th-century combinatory classification system; Leibniz’s scrinium literatum, a closet for organizing notes on little hooks; the index composed of standard-sized playing cards at the Parisian Academia des Sciences in the late 18th century; the hybrid handwritten-index-card-and-printed-paper-slip catalog William Croswell created for Harvard University in 1817; and the half-sheet card index Charles Coffin Jewett proposed at the 1853 worldwide convention of librarians (see Krajewski, 2011; Wright, 2014). While we might find a formal resonance among these various techniques and technologies – indeed, they’re all composed of small, moving pieces of information – they represent an array of aesthetics and politics. And contrary to Otlet’s conviction, information’s aesthetics, its epistemological forms, are not extraneous to its meaning. The Eames’s “fragments and glimpses,” Halpern (2014) explains, arrived in a post-World War II period defined by the rise of mathematical communication sciences, cybernetic flows, and new management and scientific theories focused on process and pattern and complexity. Within such a context, those fragments and glimpses washed over viewers in a flood – an intentional inundation – as a means of training them to find order amidst the chaotic complexity. The Library Bureau’s and Remington Rand’s card indices and filing cabinets, however, emerged over half-a-century earlier, amidst the rise of systematic management. The companies’ standardized components were meant to promote efficiency and interoperability and support “the new Science of Business System,” with its data-driven, real-time analysis, prediction, and promise of pre-emptive management. The system’s logistical efficiency – “as positive and scientific as the science of war itself” – presaged the mechanized administration of World War I. Meanwhile, Otlet’s cards, inspired by Dewey’s system, embodied a different sort of entrepreneurialism – one driven by an internationalist, even universal, mission, which was only strengthened by the war. Within the IIB, standardization and interoperability were ostensibly more about efficient and effective global intellectual exchange – about utopian visions of universal knowledge and world peace – than about managerial efficiency. Even a blank card, through its formal and aesthetic properties and its integration into a filing system, can index its political and cultural milieu. As Cornelia Vismann has observed of files, they’re “the mirror stage of any administration. Subsequently, they become the object of desire for a positivist historiography that uses files to deduce their administrative as well as their political background” (2008: 92). Files are not only read or referenced as “evidence” of something having happened, but they are also objects that we think through – and even create with. Cards don’t just record; they generate. Over the decades, cards put to personal use have provided aesthetic and intellectual inspiration to myriad artists, writers, and designers. Jules Verne, Emily Dickinson, Walter Benjamin, Ludwig Wittgenstein, Claude Lévi-Strauss, Roland Barthes, Niklas Luhmann, Georges Perec, Raymond Carver, Stanley Brouwn, and Mark Lombardi all captured fragments of thought on cards or slips (see Hollier, 2005; Krapp, 2011: 1-26; Spieker, 2008; “Taking Note”). In his study of Roland Barthes’ card files, Rowan Wilken argues that the cards served as much more than an aide-memoire; they were an “organizational device, a kind of ‘creativity machine’ that served a crucial function in the very construction of his written texts, and shaped his thinking on textuality and the role and operation of literary criticism”; in particular, Barthes’ cards informed his theories on the “fragment” and fragmented writing (2011: 9). Marshall McLuhan regarded cards as similarly generative. His Distant Early Warning Cards, created in 1969, referenced the real-life DEW Line, a band of 63 radar and communication stations that stretched across 3000 miles in arctic Canada, meant to provide early warnings of invasion during the Cold War (Belonax, 2013). McLuhan regarded artists as a human version of the DEW line – as early detectors of cultural shifts – and his cards were meant to promote such prescient perception. McLuhan’s cards preceded Brian Eno’s and Peter Schmidt’s well-known Oblique Strategies deck from 1975, which was likewise meant to promote creative, lateral thinking. As McLuhan was distributing his DEW cards, critic and curator Lucy Lippard deployed index cards as a curatorial and documentation tool: for her 1969 557,087 exhibition in Seattle – which served as the foundation for her subsequent “Numbers Shows” – she invited 60 artists to submit event-score-style proposals on 4×6-inch index cards. Volunteers executed most of the works – either in the gallery or around the city – and all the proposals were gathered together, in their original index-card form, into an unbound, re-shuffle-able catalog (Foote, 2016; Graves, 2013; Lippard, 2009; Nelson, 2008). Cards, in punched form, of course played a critical role in computing history, and even today web and software designers commonly use the “card-sorting” method to create or evaluate the information architecture of a website or program (Maxwell and Armen, 2013). Testers list various topics or functions on cards, then ask users to sort those topics into categories, which then inform an application’s structure. Software designers use cards for conceptual and data modeling, and sometimes the index card even becomes a skeuomorphic module within the software, as was the case with Notecards, released by Xerox PARC in 1984, and Hypercard, released by Apple in 1987 – and as is the case with various contemporary note-taking and writing programs, like Evernote, WritersDuet, and Scrivener (see Agile, n.d.; Mattern, 2010). Yet perhaps the most ubiquitous and persistent – “sticky,” if you will – card-like module within the design world today is the Post-It, released by 3M in 1980. Post-Its are modular, movable, cheerfully colored; they’re intuitive, low-risk, and liberatingly provisional; their small size forces users to deconstruct big ideas into tiny parts; they foster collaboration by giving license to team members to post even their smallest, most disposable ideas; and their tangibility fosters material connections between the people using them (see also Post-It; Lavenda, 2014). Designer Jamer Hunt (2010) notes that their low barrier to entry – a Post-It and a Sharpie are the new basic design tools – democratizes design and makes it accessible to “lowercase ‘d’ designers who are not necessarily skilled in drawing, rendering, or model-making.” Post-Its have many of the material and operational virtues of Dewey’s index and Otlet’s Repertory (minus the comprehensive classification systems) – but their epistemology is much more local, crowd-sourced (amateur? ), and provisional – and, I would add, perhaps wastefully disposable. I’ve encountered many an “ideation” session in which the Post-It collage – itself a mini-World Expo of multi-colored adhesive wall art – seems to be the prime focus. A complex, polychromatic paper geometry creates the semblance of productive “design thinking”; it’s an index of creative labor. As Design Thinking becomes the panacea for so many ailing or stagnant industries, as “creativity becomes the lubricant of the innovation economy,” what says “innovation” more clearly, Hunt asks, “than a crazy quilt of Post-Its?” All those Small pieces add up to something Beautiful. Could it be, as the ICIC said of Otlet’s IIB, that the Post-It’s proponents are fetishizing their methods and instruments, reifying the process, mistaking the means for the end? However gratuitous, methodolatrous, or wasteful this paper-intensive design practice might be, the Post-It map – even if it produces no concrete vision of a thing that will be materialized in the world – serves as a topological model of the design process, of intellectual work, itself (see Mattern, 2013). Otlet, particularly in his exhibition collaborations with Otto Neurath and Patrick Geddes, celebrated the value of models as pedagogical devices, as means of making abstract, complex forces in the social world both material and intelligible (Vossoughian, 2011). A model was also one of the chief exhibits at the 1964-65 World’s Fair – and it remains today a key attraction at the Queens Museum. Moses commissioned Raymond Lester Associates, a model-making firm he had employed regularly in his urban planning practice, to create a 9,000-square-foot wood, plastic, and paper model of all 830,000 buildings in New York’s five boroughs. The Panorama of the City of New York was intended to celebrate the city’s 300th anniversary – but it also lionized Moses; he shaped many of the urban forms that were immortalized here in miniature. Lester & Associates consulted Sanborn fire insurance maps, aerial photographs, and a host of other city records – undoubtedly indexed in its libraries’ and archives’ card catalogs – in order to construct a model with less than one percent margin of error (Queens Museum). And it, like Rand’s and Dewey’s and Otlet’s card indices, was meant to be modular and expandable. The model underwent updates in 1967, 1968, 1969, 1974, and 1992. Amidst all the push-button gadgetry and spectacular automation of the fair, these paper buildings – illuminated with a dawn-to-dusk-to-night lighting cycle, animated with moving miniature airplanes, and indexed with colored lights on all municipal facilities – had widespread analog appeal. And today, as our urban imaginaries and epistemological visions are driven by sensors and data and a “Science of Business System” that bests Dewey’s wildest dreams, visitors still flock to that paper and wood model, an index of not only the world they live in, but of the material and mechanical means – the small, moving parts – we devise to understand it. Much of this section on Remington Rand and the 1939-40 World’s Fair is adapted from Mattern 2016. According to Yates (1989), “systematic management” was the informational counterpart to scientific management. Systematic management emphasized system and efficiency, and relied heavily on detailed record-keeping and “formal and systematic modes of communication,” flowing “up, down, and across corporate hierarchies”; these systems, mandated by top management, served to “control and coordinate processes and individuals”; and “draw data and analyses up the hierarchy to serve as the basis for managerial control” (xv, 1, 2). See also the work of Wilhelm Ostwald, Karl Bührer, and the German collective, Die Brücke (“The Bridge”), which named Otlet its honorary president. Die Brücke, like the IIB, sought to connect formerly-isolated knowledge spaces and to normalize the means by which knowledge was created and shared among schools, universities, offices, labs, government agencies, and private citizens. Ostwald believed that the “organization of intellectual labor must begin with the purely mechanical ordering of written and printed documents,” so Die Brücke proposed the World-Formats, including a standardized paper format, in order to both economize on the use of space and ensure that the material form of knowledge was universally transferrable, accessible, and storable (quoted in Vossoughian 2014): 172; see also Krajewski 2012). Ostwald, like Otlet, aimed to “split up scientific communications into very small component parts” (quoted in Hapke 1999: 143). The group sought to standardize publication formats and their modes of distribution, and the furnishings and architectures used to house them. In many of their proposed designs, the standard index card serves as a spatial module that can be scaled up infinitely to generate architectural and perhaps even urban forms. The American Library Association also appeared at the 1904 St. Louis World’s Fair. They created a small branch of the St. Louis Public Library, featuring Library Bureau furnishings and a card catalog supplied by the Library of Congress. The LOC also hosted an exhibition at the U.S. Government Building, where they displayed the evolution from handwritten to printed catalog cards (Eberhart 2016). See Vossoughian (2011) and Wright (2014) for fascinating discussions of Otlet’s relationship with Otto Neurath and Patrick Geddes, both fellow pioneers in exhibition design, who carefully considered the epistemological and pedagogical significance of various forms of exhibition media and installation strategies. Consider, too, Emmanuel Goldberg’s Statistical Machine, a workstation that would use “search cards” to find and retrieve records storage on microfilm. When Vannevar Bush sought to patent his Memex, the Patent Office rejected his application, citing Goldberg’s 1927 design (Wright 2011: 208-9). Adams, Margaret O’Neill. (1995) “Punch Card Records: Precursors of Electronic Records,” American Archivist 58: 182 –202. Agar, Jon. (2003) The Government Machine: A Revolutionary History of the Computer. Cambridge, MA: MIT Press. Bennett, Robert. (2010) “Pop Goes the Future: Cultural Representations of the 1939-1940 New York World’s Fair,” pp. 176-191 in Robert W. Rydell and Laura Burd Schiavao (eds) Designing Tomorrow: America’s World’s Fairs of the 1930s. New Haven: Yale University Press, 2010. Bletter, Rosemarie Haag (1989) “The ‘Laissez-Fair,’ Good Taste, and Money Trees; Architecture at the Fair,” pp. 104-135 in Queens Museum (ed) Remembering the Future: The New York World’s Fair From 1939 to 1964. New York: Rizzoli. Day, Ronald E. (2001) The Modern Invention of Information: Discourse, History, and Power. Carbondale, IL: Southern Illinois University. Dickstein, Morris. (1989) “From the Thirties to the Sixties: The New York World’s Fair in Its Own Time,” pp. 20-39 in Queens Museum (ed) Remembering the Future: The New York World’s Fair From 1939 to 1964. New York: Rizzoli. “The Exhibits: An Amazing Array,” New York Times (April 30, 1939): 7-8. A Filing Primer Used by Boston School of Filing, Illinois School of Filing, Philadelphia School of Filing. Philadelphia: Library Bureau, 1921. Flanzraich, Gerri. (1993) “The Library Bureau and Office Technology,” Libraries & Culture 28(4): 403-29. Letter from Katherine B. Gray, to S. M. Knapp, Vice President and Treasurer, Remington Rand, March 19, 1940, New York Public Library, New York World’s Fair 1939 and 1940 Incorporated Records, MssCol 2233, b. 392 f. 14: Remington Rand, Inc. (1940). Halpern, Orit. (2014) Beautiful Data: A History of Vision and Reason Since 1945. Durham, NC: Duke University Press. Hapke, Thomas. (1999) “Wilhelm Ostward, the ‘Brücke’ (Bridge), and Connections to Other Bibliographic Activities at the Beginning of the Twentieth Century,” pp. 139-147, in M.E. Bowden, T.B. Hahn, and R.V. Williams (eds) Proceedings of the 1998 Conference on the History and Heritage of Science Information Systems. Medford, NJ: Information Today. Harwood, John. (2011) The Interface: IBM and the Transformation of Corporate Design, 1945-1976. Minneapolis: University of Minnesota Press. Heide, Lars. (2009) Punched-Card Systems and the Early Information Explosion, 1880-1945. Baltimore: Johns Hopkins University Press. Hollier, Denis. (2005) “Notes (On the Index Card),” October 112: 35-44. Krajewski, Markus. (2012) “Die Brucke: A Germany Contemporary of The Institut International de Bibliographie,” Cahiers de la documentation (Feb 2012): 25-31. Krajewski, Markus. (2011) Paper Machines: About Cards & Catalogs, 1548-1929. Cambridge, MA: MIT Press. Krapp, Peter . (2011) Noise Channels: Glitch and Error in Digital Culture. Minneapolis: University of Minnesota Press. Laqua, Daniel. (2013) The Age of Internationalism and Belgium, 1880 – 1930: Peace, Progress and Prestige. New York: Manchester University Press. Library Bureau. (1909) The Story of Library Bureau. Boston: Cowen Company. Lyon, Peter. (1964) “A Glorious Nightmare,” Holiday (July 1964): 50-54. New York Worlds Fair Inc., News Release No. 608, New York World’s Fair Inc., Department of Press, Perley Boone, Director, stamped February 15 1939, New York Public Library, New York World’s Fair 1939 and 1940 Incorporated Records, MssCol 2233, b. 390 f. 15: Remington Rand, Inc., 1939 Jan 1 – Dec 31. Otlet, Paul. (1920) “International Organization of Bibliography and Documentation,” pp. 173-203 in W. Boyd Rayward (trans.) International Organization and Dissemination of Knowledge: Selected Essays of Paul Otlet. New York: Elsevier, 1990. Otlet, Paul. (1893) “Something about Bibliography,” pp. 11-24 in W. Boyd Rayward (trans.) International Organization and Dissemination of Knowledge: Selected Essays of Paul Otlet. New York: Elsevier, 1990. Otlet, Paul. (1918) “Transformations in the Bibliographical Apparatus of the Sciences: Repertory – Classification – Office of Documentation,” pp. 148-56 in W. Boyd Rayward (trans.) International Organization and Dissemination of Knowledge: Selected Essays of Paul Otlet. New York: Elsevier, 1990. Rayward, W. Boyd. (1975) The Universe of Information: The Work of Paul Otlet for Documentation and International Organization. Moscow: All-Union Institute for Scientific and Technical Information. Rayward, W. Boyd. (1994) “Visions of Xanadu: Paul Otlet (1868 – 1944) and Hypertext,” Journal of the American Society for Information Science 45(4): 235-50. Reitano, Joanna. (2006) The Restless City: A Short History of New York from Colonial Times to the Present, 2nd Ed. New York: Routledge. “Remington Rand, Incorporated,” Fascimile, n.d., New York Public Library, New York World’s Fair 1939 and 1940 Incorporated Records, MssCol 2233, b. 390 f. 15: Remington Rand, Inc., 1939 Jan 1 – Dec 31. Samuel, Lawrence R. (2007) The End of Innocence: The 1964-1965 New York World’s Fair. Syracuse: Syracuse University Press. Spieker, Sven. (2008) The Big Archive: Art from Bureaucracy. Cambridge, MA: MIT Press. Taylor, Frederick Winslow. (1911) The Principles of Scientific Management. New York: Harper & Row. van den Heuvel, Charles. (2014) “Building Society, Constructing Knowledge, Weaving the Web: Otlet’s Visualizations of a Global Information Society and His Concept of a Universal Civilization,” pp. 127-53 in W. Royd Rayward (ed) Information Beyond Borders: International Cultural and Intellectual Exchange in the Belle Epoque. London: Ashgate. Vismann, Cornelia. (2008) Files: Law and Media Technology, Geoffrey Winthrop-Young (trans). Stanford: Stanford University Press. Vossoughian, Nader. (2014) “Collecting Paper: Die Brücke, the Bourgeois Interior, and the Architecture of Knowledge,” pp 170-80 in W. Boyd Rayward (ed) Information Beyond Borders: International Cultural and Intellectual Exchange in the Belle Epoque. Burlington, VT: Ashgate. Vossoughian, Nader. (2003) “The Language of the World Museum: Otto Neurath, Paul Otlet, Le Corbusier,” The Review of the Union of International Associations 1-2: 82-93. Vossoughian, Nader. (2011) Otto Neurath: The Language of the Global Polis. Rotterdam: NAi Publishers. Wallock, Leonard. (1988) “Introduction,” in Leonard Wallock and William Sharpe (eds) New York: Cultural Capital of the World, 1940-1965. New York: Rizzoli. Wilken, Rowan. (2010) “The Card Index as Creativity Machine,” Culture Machine 11: 7-30. Wright, Alex. (2014) Cataloging the World: Paul Otlet and the Birth of the Information Age. New York: Oxford University Press. Yates, JoAnne. (1989) Control through Communication: The Rise of System in American Management. Baltimore: Johns Hopkins University Press. Yates, JoAnne. (1991) “Investing in Information: Supply and Demand Forces in the Use of Information in American Firms, 1850-1920,” pp. 117-54 in Peter Temin (ed) Inside the Business Enterprise: Historical Perspectives on the Use of Information. Chicago: University of Chicago Press.